Lipidol Oils / Gee Whiskers! This past winter I have been using a lot of body oils to help alleviate the dryness of my skin. 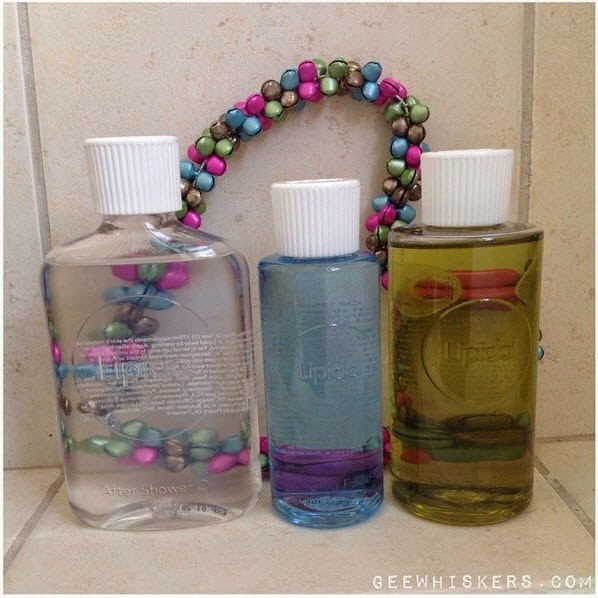 I actually had 4 bottles of body oils on my one bathroom shelf! They all vary in price and I have 2 in particular that are almost R600 a bottle. I hardly use them because I can't fully justify spending so much on a bottle again and it means that I reserve them for times where I feel like a treat. When I received a bottle of Lipidol's After Shower Oil I was beyond thrilled. I immediately started using it because I really do enjoy trying new things out. The After Shower Oil comes in a clear plastic bottle. I personally really like the "simple" packaging because I have 2 oils that are in glass bottles and I am always very scared of dropping them and at times they have slipped a bit out of my grip. So, the plastic bottle might not be all that great to some people but I personally love it. The oil itself is scented using Chamomile essential oils. I really love how warm and soft the fragrance is. It is perfect for bedtime. The biggest thing I hate with some body oils is the thick, greasy film it leaves on my skin. I am really happy that Lipidol's formula is easily absorbed and doesn't leave and greasy feeling on your skin once absorbed. This oil is designed to replace moisture lost during bathing or showering and it does a great job of doing this. My skin always feels soft, smooth and moisturised after applying this. A 175ml bottles retails for R79.95 and what is even more fantastic is that Lipidol's entire range of 6 oils all cost R79.95 each. The size of the products vary but R79.95 is still incredibly affordable even for the 50ml facial oil. Because I loved the After Shower Oil so much I quickly made my way to Clicks when they were released - you can currently get Lipidol's entire range at selected Clicks stores. I picked up the Cleansing Face Oil (Blue bottle) and Body Cleasing Oil (Green Bottle). I also picked up a bottle of After Shaving Oil for my fiancé which I didn't photograph. The oil is fragranced with Rosemary and Niaouli essential oils which immediately makes this a treat to use. I really love using products that are fragranced with essential oils because not only do they smell great, but I know that they have incredible properties on their own to help benefit my skin. The oil is used to remove dirt and makeup without stripping the skin of its natural oily layer. The way to use this is to pour about a teaspoon of the product into that palm of your hand (make sure you washed your hands first), then massage the oil all over your face and neck area. Then simply splash a bit of warm water on your skin to allow the oil to emulsify (it turns a white milky colour). Massage your face a little longer and wash the oil off your face. What I love about this method of washing my face is that I do have dehydrated skin and this helps to keep my skin hydrated and moisturised. I also love how great this oil is at removing makeup - even stubborn mascara. I really love the lime essential oils added to the oil to fragrance it. I find citrus scented bath washes are usually my favourite because it refreshes me. As with the facial oil the body oil is applied to dry skin and massaged over your body before adding water to emulsify the oil. I love this way of washing my body. The way I do it is to apply the body oil to your skin before stepping into the shower or climbing into the bath. At first the oil is going to feel rather thick and heavy on your skin, but as soon as the water hits it, it starts to emulsify and lather up into a soft foam. Once you've washed your body and step out the shower / bath you'll only be left with a very thin film of the oil on your skin. The rest of the oil has done its job of bonding with the dirt and excess oils on your skin and at the same time some has been absorbed to help kick up the moisture in your skin. I know this sounds silly, but I really enjoy using these kinds of products because to me it's almost "magical" how the oil is transformed. Other products in the range: Sunscreen Oil (125ml), After Shave Oil (100ml) and Overnight Face Oil (50ml). Again all of the 6 oils retail for R79.95 each. Megan, these products are amazing! I used the after shave oil on my legs last night and was thrilled with it!